Changlang, October 31, 2018: RASHTRIYA EKTA DIWAS in commemoration of Birth anniversary of the Legendary Sardar Vallabh Bhai Patel was observed in Changlang district Headquarters on 31/10/2018. The National Unity Day witnessed mass participation from all walks of life including Government Officials, Students, Teachers, Security Personnel, Public Leaders, Bazaar committee members. 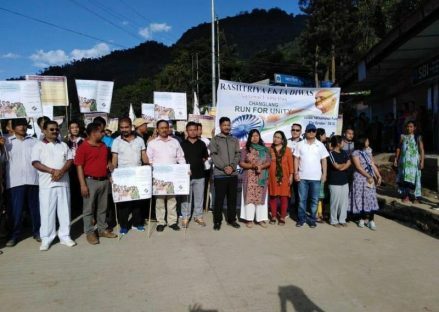 A Run for Unity Marathon Race of around 3 km organized by District Administration was led by local MLA Shri Tesam Pongte 53-Changlang North Assembly Constituency from TT Point to culminating at DIET Auditorium in Changlang district Head quarters. The event witnessed colorful UNITY MARCH demonstration by Contingents of Civil Police led by SP Shri J.K Lego and 149 CRPF. 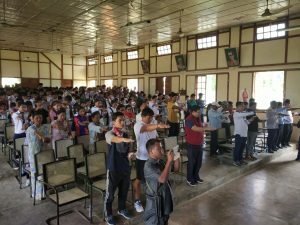 At DIET Auditorium, Unity Pledge was administered by local MLA to all participants, speeches on the life of Sardar Vallabh Bhai Patel from the participants and Art and Drawing competition for Students and participants were organised by the department of Education headed by DDSE Changlang Shri.Hortum Loyi.